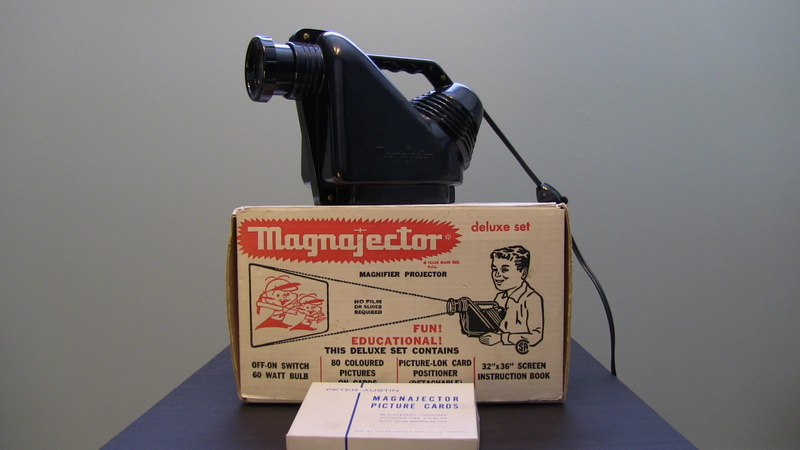 The Magnajector is an opaque projector that was created in the 50s by Rainbow Crafts Inc of Cincinnati Ohio, a company that is more popularly known for being the inventors and original distributers of Play-doh. 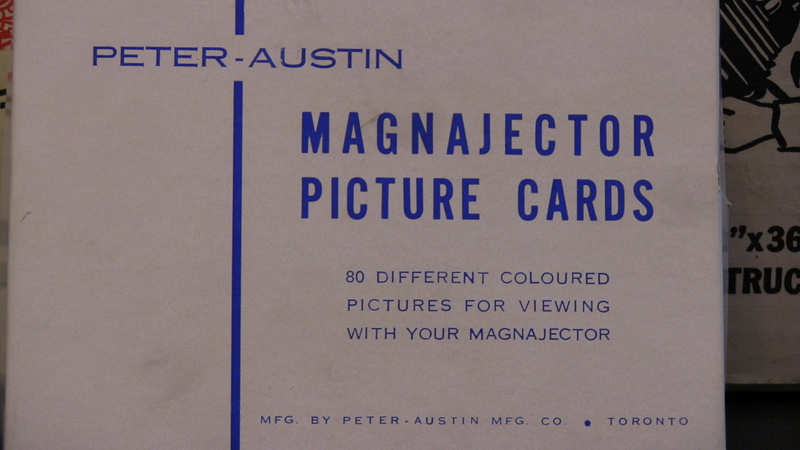 This particular Magnajector is stamped with the Peter-Austin Mfg Co. mark, which was a Canadian company that handled the manufacture and distribution of a variety of toys from the USA. It came with a box of 80 coloured viewing cards that are just postcard sized pictures of random things. I grew up in churches and so was very familiar from a quite young age with the much more popular technology of overhead projectors and transparencies. I was twelve the first time I encountered a Magnajector in the basement of my great uncle’s house during summer vacation. I remember at the time being flabbergasted that it wasn’t the more popular technology–it was so simple and compact and easy. It was like that moment when you first hear as a kid that electric cars have been around for decades, and then you start to wonder what’s wrong with the world. As it turns out, in this case it wasn’t a global conspiracy of the Big Overhead group that was keeping the Magnajector hidden from the masses. 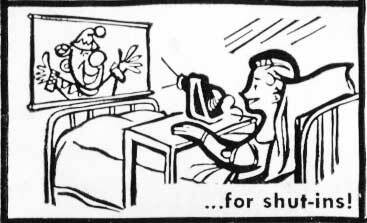 The Magnajector simply couldn’t safely output at the light levels needed for large auditoriums in the way that the overhead projector could. 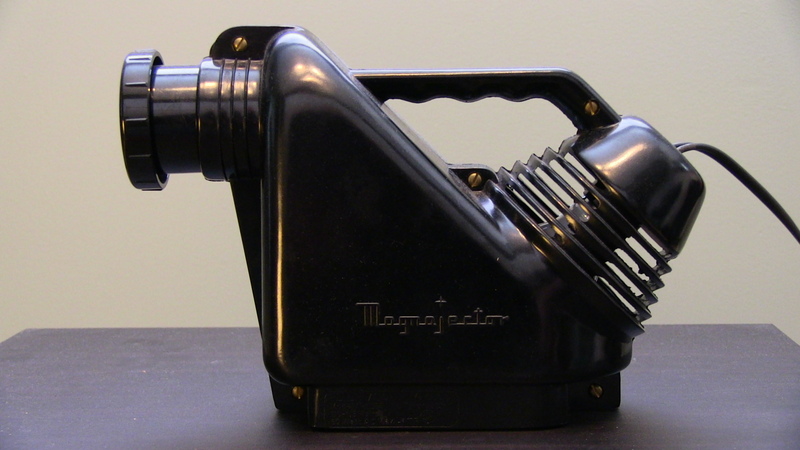 With the Magnajector you were in danger of burning up anything you put it on if you put too bright a bulb in it. A big part of ‘play’ as a kid is showing off–whether it’s showing the picture you painted or the fort you built or the cartwheel you learned how to do. The Magnajector was a really clever way for kids to do that. Without any technical knowledge, you could project Susy’s drawing onto the wall for the whole family to see. With a little extra work, a kid could make their own slideshow or cartoon. Compare that to the level of technical knowledge needed today for kids who make and upload Lego and Minecraft YouTube videos. I think at their core these are all the same activities, but the technological gap between them is staggering. Another item of note that is slightly off the original topic has to do with the Peter-Austin Manufacturing company. This isn’t the first time that I’ve discovered that the particular item I have in my museum was actually a Canadian-made variation of the original product with it’s own unique serial codes and some slight changes. While I’m familiar enough with the idea of foreign companies needing a Canadian distribution company to launch a known brand in this country, the thought of a company setting up manufacturing of a product in Canada unfortunately feels really archaic. Distribution and production have very little to do with each other anymore. 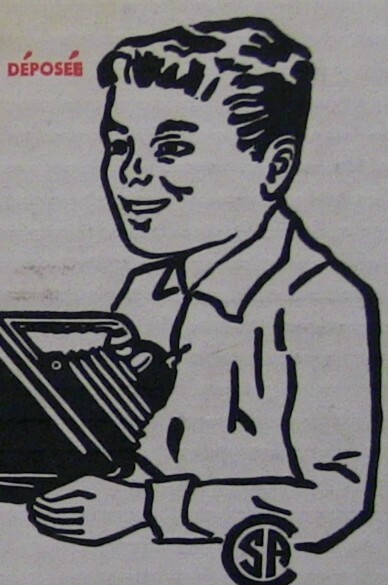 I’m forever bothered by the art style from this time that drew small children to look like smaller middle aged adults. If you gave this boy a pipe he’d be indistinguishable from a fifty year old man. I had one when I was a kid , and have since acquired another one. The picture on the wall is very fuzzy and I can barely make anything out. The distance is only about 6 ft I’ve tried adjusting the endpiece. Am I missing a part ? Any ideas? I used to love it. Btw you are a very good writer! I just picked one up at a second-hand store. All the parts seem to be there EXCEPT the instructions. There is a small plastic piece that the projector sits on, and a small piece of glass in a plastic setting that does something. The light works, it looks like it was hardly used, but I can’t figure out how to actuallly project an image. Does anyone have directions? You set the Magnajector on the image you want to project and turn it on. It should shine that image on the wall. It needs to be in a really dark room.